The Metro South Region is a great place to live and do business. It is one of the fastest growing regions in Massachusetts with 10,000 new arrivals each year since 1959. The Metro South economy is strong and vibrant. The city of Brockton, the heart of the region, has a population of nearly 100,000 people, making it one of the largest cities in the state. Each community within Metro South possesses a wealth of opportunities and resources to compliment any business or lifestyle. Metro South is a major market with more than 340,000 people. Over six million people live within a fifty-mile radius, while half the population of Massachusetts is within thirty minutes of the region. To find out more about the Metro South visit About the Region, where you will find phone numbers and other information you will need when moving to the area. To have a map or relocation packet mailed to you, please email us. Looking for help with housing. Visit the chamber’s business directory and search for qualified members who can help you in your search for a home in the Metro South region. If you are looking to purchase a home simply search under the category of Real Estate/Residential or if you are looking to rent, search under Apartment Rentals or Real Estate/Property Management. The Metro South is a great place to do business. 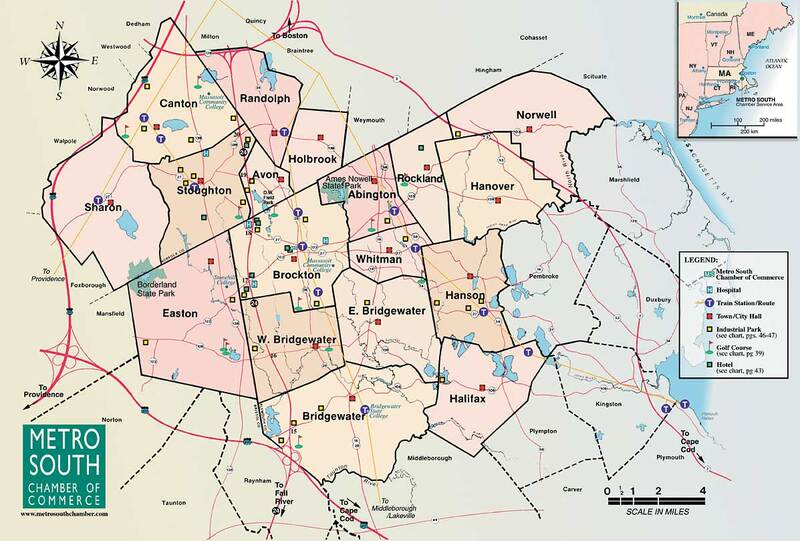 Business executives can rest assured that a decision to relocate or expand in the Metro South region of Massachusetts is a sound one. The region has the resources, workforce, transportation, and political support to meet your company’s future goals. That’s why companies such as W.B. Mason, Shaw’s Supermarkets, Chadwicks of Boston, and Reebok International have chosen the Metro South as their home. Metro South is minutes from Cape Cod and from Boston; strategically located on Route 24, between Route 128 and Interstate 495. Routes 3, 24, and 28 provide easy access to the airport, seaport, and intermodal facilities of Boston. 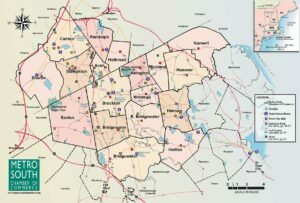 Brockton, the hub of the region is 20 miles south of Boston, 30 miles northeast of Providence, 40 miles west of Cape Cod, and 200 miles northeast of New York City. Six million people live within a fifty-mile radius of the region. One-third of the nation’s population is within overnight truck delivery. The state and local government, along with the business community have forged partnerships to support economic development in the Metro South. The state has a number of incentives available to new and expanding businesses in the region. Qualified businesses operating within Brockton, which is one of 36 Economic Target Areas in the state, are eligible for special tax and financing incentives such as a 5% Investment Tax Credit for all businesses, including manufacturing, a 10% Abandoned Building Tax Deduction, and Local Property Tax Benefits (Special Tax Assessment or Tax Increment Financing). Brockton is one of the top three communities in the state to aggressively take advantage of special property tax assessments. A number of financing mechanisms exist to assist companies with relocation and expansion. The state offers a number of programs, including tax-exempt and taxable industrial development bonds, an equipment purchase/lease program, and three loan guarantee programs to help provide access to capital: the Capital Access Program, the Massachusetts Export Finance Guarantee Fund, and the Emerging Technology Fund. Savvy developers can also take advantage of state and local assistance with idle Brownfield sites. Local banks can provide a wide range of lending services and are strongly committed to assisting with relocation and expansion financing requirements. They have a long history of mutual cooperation in creating financing packages, blending several different financing mechanisms. Visit our business directory to search for local banks. Local commercial realtors are experienced with the local market and can assist your company with your relocation needs. If you are interested in buying, renting, selling, or leasing commercial property in the Metro South then contact one of member commercial realtors by visiting our business directory and searching under Real Estate/Commercial.